Stock up on those must-haves for their Everyday wear! Shop and save on Best in Basics. Get Up to 50% Off Hundreds of wear, select styles for baby Boy & Girl, toddler Girl & Boy, Girls & Boys during The Great Big Sale. Based on original retail price. Excludes new arrivals. Sneak Peek! Make a Splash! Shop and save on Swimsuits, Rushguard sets, swim trunks and more. CLEARANCE SAVINGS! Get Oshkosh B’gosh Tlc Real Magic Tunic for $5.99 CAD, Reg. Price – $18 CAD. Get 25% Off select outerwear & winter boots. Looks to Love! Find Fresh New Outfits perfectly styled for every occassion! Get 20% Off when you spend $50 and sign up for the Carter’s newsletter. Limited time. CLEARANCE SAVINGS! 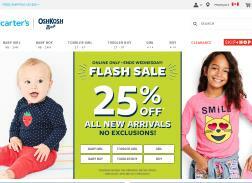 Get Oshkosh B’gosh Suspender Jeans – Derby Wash for toddler boy from $12.99 CAD, Reg. Price – $24 CAD.